With a manufacturing history dating back more than 290 years, Böttcher Systems is not only one of the oldest companies in the world – in any industry, not just printing – but also a testament to the importance of on-going investment in new technology and products. Very few companies in the world can claim a pedigree stretching as far back as Böttcher Systems. In 2015 the company celebrated 290 years in continuous operation since Johannes Loosen first opened for business as a tanner in 1725 in Cologne. That puts the company in a very elite group indeed. A pre-GFC Bank of Korea report in 2008 found there were only 5,586 companies in the world that had been operating more than 200 years (and more than 3,000 of those were in Japan). Given that there are perhaps over 235 million companies in the world (according to Dun & Bradstreet, 2013) that makes any company over 200 years old, let alone one which is a decade shy of 300, extremely unusual indeed. To put it into context, when Loosen first started making leather in Germany, America was still a colony and, for most Europeans, Australia was just a fantasy land. Indeed Captain Cook hadn’t even been born. The number of businesses that have come and gone in the interim, not just in Australia but worldwide, is hard to imagine let alone quantify. The other remarkable aspect of this longevity is that the company is still family-owned and is now into its eighth generation of uninterrupted family ownership. The original Felix Böttcher didn’t come on the scene until 1878 when he founded a factory in Leipzig to produce gelatin rollers for printing. Then, in 1892, the two strands of the Loosen and Böttcher families came together and the rest, as they say, is history. 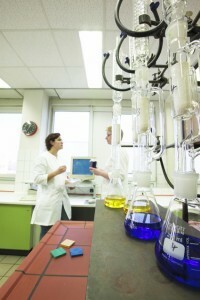 Cologne and Leipzig are still the main commercial and technical centres for the company. Needless to say, family-owned companies with such a heritage are few and far between. Mostly they still operate in small, traditional crafts such as jewellery, glass-making or brewing. Even fewer have managed to adapt and succeed in a commercial field such as industrial chemicals and hi-tech engineering, all the while expanding to operate on a global scale. To have achieved this makes Böttcher Systems virtually unique as a company. So what is the secret of its longevity and what, if anything, does this history mean for customers in today’s fast-moving, technology-based printing industry? The common denominator in terms of what Loosen and Böttcher were doing way back in the 18th and 19th centuries – tanning leather, making glue and producing gelatin rollers for printing presses – is that they were at the forefront of what was technologically possible at the time. 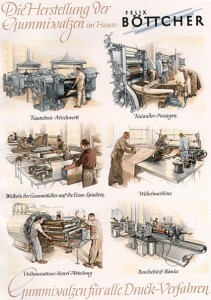 This tradition of innovation has continued throughout the 290-year history of Böttcher Systems, spanning the development of rubber-coated printing rollers in the 1930s and moving into new technological areas such as pressroom chemicals and blankets, and digital printing components (which began, for Böttcher, back in the 1980s). Over the years, the company’s technological expertise has enabled it to establish OEM partnerships with major press manufacturers such as Heidelberg, manroland and KBA, to the extent that wherever you go in the printing world today, the chances are there is a Böttcher product at work in the pressroom. The company operates in 34 countries around the world, including 19 production plants in 13 countries, and about three-quarters of its turnover derives from sales outside Germany. After 290 years of innovation, developing new solutions remains a key part of Böttcher’s focus at its R&D facility in Germany. Just as it did more than 290 years ago, however, the heart of the company’s production lies in Germany, most notably at its mixing plant in Gelsdorf which manufactures all the rubber used in Böttcher products, and at its R&D facilities which employ 80 staff solely for the purpose of developing and testing new compounds. While other companies have seen their markets disrupted and disappear, Böttcher has managed to adapt to shifting technology trends while remaining true to its engineering heritage. So, for instance, in the printing industry there are new product lines such as the Vita range of packaging consumables which are designed and tested to meet all food packaging requirements for all print processes. This addresses one of the growth areas in the current printing market where there is a need for standardised, safe, low-migration products across different processes and geographical markets. Another area is low-energy UV offset printing in which Böttcher has invested resources to develop specific rollers, blankets and washes to meet the different requirements of LED UV curing. This focus on R&D means that, over the course of nearly three centuries, Böttcher has amassed a vast amount of knowledge and expertise about the properties and performance of different materials and compounds. It is a legacy which is impossible to match in the industry. “We’ve seen a lot of change in the printing industry over the past decade, and Böttcher has continued to address the demands of this on-going evolution,” said Mulligan. “We do this from a position of security founded on our engineering heritage. Our clients know that if they have a production issue or a technical challenge, we will always be here to assist them.